If you are looking for a fun, interesting read this summer, may I recommend "The First Husband" for your poolside perusal? I really enjoyed this book. 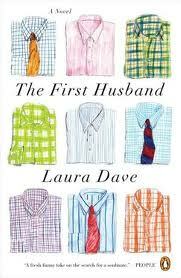 And it takes a lot for me to enjoy a book, especially one as unassuming and unpretentious as Laura Dave's new work. Told through the voice of a travel writer who has just been dumped by her long-term boyfriend, the book chronicles the crazy rebound adventures of a woman who doesn't know who she is or what she wants--or are they rebound adventures after all? I loved all the characters. The ex-boyfriend, the new husband, Annie herself, her best friend, the new husband's ex-girlfriend, the brother, both the mothers. I mean, that's a lot of characters to introduce in an engaging way, and Dave manages it with aplomb. Hell, I even liked the dog. And because I liked all the characters so much, I found myself in an odd predicament. I didn't care what happened. I wanted to know what happened, fiercely, but whatever it was, I would have liked it the same just the same. I wanted happiness for all! This meant that I had a hard time predicting what the main character would choose or what would happen to her. So that as light and airy and cute as this book was, it had me on the edge of my seat. Well done, Laura Dave. There's a reason you're all up in the NYT, huh? Talk about this book over at BlogHer Book Club! Thank you for your kind review! Glad you enjoyed the book. 5. Bangladesh has numerous sources of natural beauty, marvelous places and sceneries. Miles of golden sands, towering cliffs, surfing waves, colorful rare conch shells and tribes, delightful sea-food, Buddhist temples, ponderous pagodas —all this makes Cox’s bazaar the tourist capital of Bangladesh. The World's longest unbroken (120 km) natural sandy sea beach slopes here gently down to the blue waters of the Bay of Bengal. Against the picturesque background of a chain of forested hills with rich wildlife made this beach as one of the most attractive tourist spot in the world.